DR. BASSLEER BIOFISH FOOD CHLORELLA comprises not only all natural components required for well-balanced feeding, but also the valuable Chlorella freshwater algae. This algae abounds in carotinoids (e.g. lutein, astaxanthin), antioxidants (e.g. beta-carotin), essential unsaturated fatty acids (e.g. omega-3), vitamins and trace elements (iron, selenium, iodine, folic acid, calcium). Chlorophyll as well as valuable nucleic acids foster the regeneration process. 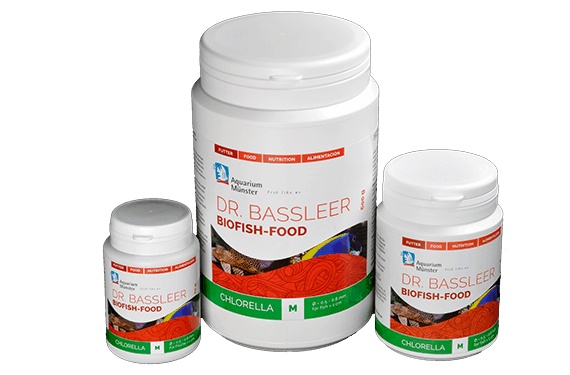 DR. BASSLEER BIOFISH FOOD CHLORELLA is thus easily digestible, thereby representing almost no stress to the aquarium water. DR. BASSLEER BIOFISH FOOD CHLORELLA is offered in the different granulate sizes M, L, XL and XXL. The granulates in smaller pellet size M sink slowly, thus providing nutrients to all three water zones. This gives surface feeders, fish in the middle zone as well as bottom feeders alike a fresh and balanced diet.